The original story idea for Ninja Express was far different than what became the final version. It’s original title was “Animanga” and the central characters were going to be a male 10-year-old mech pilot and a kunoichi who was his childhood best friend that had magical pet. The second version took on the title of Ninja Express but was going to be focused on the team being a clan of down on their luck ninja trying to make a living in a world where ninja are nearly forgotten. The biggest difference in this version from the final version was that Yuki had a far smaller role in the series and she was Otaki’s little sister and not Sayaka’s. This concept met with a few logistical issues and eventually evolved into what Ninja Express is today. Otaki has lived a life of mediocrity; only experiencing adventure vicariously through the heroes of his favorite anime and video games. Upon entry into high school he decides to break free of his existence as one of life’s side characters and take the spotlight for himself. His plan: join his school’s ninja club, the Ninja Beast Assassination Squadron! Unfortunately for Otaki he neither has physical prowess, latent talent, nor tactical skill required by the squadron and he fails to make it into the Ninja Beasts. 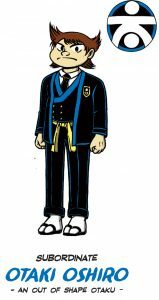 A series of events lead Otaki to join his school’s new start up ninja club, Ninja Express. Now, under the harsh tutelage of Sayaka Katsuragi, Otaki trains to become a ninja so that one day he can be a person worthy of standing alongside the heroes he has grown up to admire. Sayaka is the eldest daughter and heir to the Katsuragi ninja clan. In recent years her clan has fallen on hard times, but Sayaka has a plan to restore her clan to prosperity. Upon entry into high school she forms a ninja club named Ninja Express to attract new recruits and potential clients. With her younger sister Yuki and her childhood friend Emomaru as her club’s founding members, Sayaka leads her club as its president. Sayaka is cool and calculating, always keeping a level head even in the most dire of circumstances. In spite of her young age she has mastered hundreds of ninja weapons and techniques. She is an excellent strategist, using her intellect and wit to trick far more powerful foes to fall prey to her masterfully laid traps. She is completely obsessed with living the life of a “true ninja” and makes no time for anything else, which has served as both a benefit and a problem for her. Emomaru serves as the vice-president of Ninja Express. 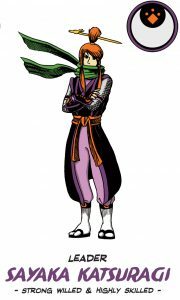 He is a skilled ninja that has trained alongside Sayaka since middle school. He rarely shows emotion and it often falls to him to be the team’s voice of reason. His calm expression hides the sorrow of his past, a past that has led him on a quest for vengeance against a man known only as “THAT Guy”. 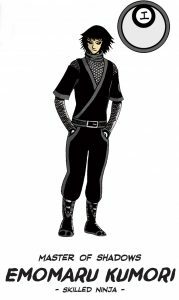 Besides his extensive knowledge of ninja weaponry, Emomaru has the ability to animate his shadow into a being known Kagemaru, a living shadow that fights in his stead. With such an arsenal at his disposal, he is the top fighter of Ninja Express. This fact has fostered a one-sided rivalry on the part of Otaki. Yuki is a bright and energetic middle school student who, due to her age, is an unofficial member of Ninja Express. Though she is Sayaka’s younger sister, she holds little interest in pursuing the life of a ninja. She prefers sleeping in late rather than participating in Sayaka’s early morning training sessions; a luxury that often eludes her these days ever since Otaki joined the team — he needs a lot of extra training. Yuki’s fighting style revolves around the shuriken embedded in her head. 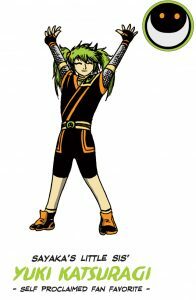 Through an unfortunate accident, the shuriken has become infused with Yuki’s chakra and she has the ability to control its trajectory with her mind as well as create illusions of it to confuse her foes. Taiga is a second year high school student and the final member of Ninja Express. He is the only non-ninja member of the club. Before joining Ninja Express, Taiga was president of a martial arts club during his freshmen year. At the end of the year he organized a fighting tournament among his members, a tournament which left him as the sole survivor. For reason unknown to him he couldn’t find new members the following year… enter Sayaka. The two struck a deal in which he would join Ninja Express and allow Sayaka to use the club room in exchange to still be allowed to use the room for his training.